5 and from Jesus Christ, the faithful witness, the firstborn of the dead, and the ruler of the kings of the earth. To him who loves us, and washed us from our sins by his blood; 6 and he made us to be a Kingdom, priests to his God and Father; to him be the glory and the dominion forever and ever. Amen. 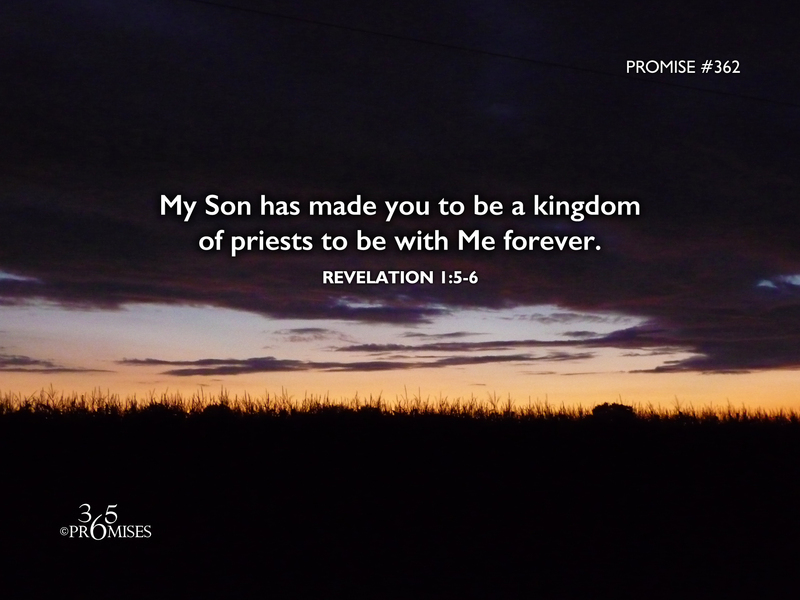 The NIV Bible says that Jesus made us to be a kingdom and priests to serve his God and Father. The Amplified Bibles says that Jesus formed us into a kingdom (a royal race), priests to His God and Father. The KJV Bible says that Jesus has made us to be kings and priests to Father God. No matter what Bible translation you prefer, we have a very high calling. Our Elder Brother has paid the price through His shed blood for us to be part of a royal priesthood that will minister unto His God and our God, His Father and our Father... forever! What a glorious thought! We are part of the highest royal family in the universe, not just when we get to heaven, but right now! May the Holy Spirit give us revelation to know how high our heavenly calling is so that we might have a supernatural insight to know how to walk out our destiny as a kingdom of priests to our God and Father today.